Great deals to Vilamoura up to -70% off To take advantage of these offers, join now for free! Enjoy luxury holidays to Vilamoura with Voyage Prive, and discover its breath-taking beaches, famed golf courses and captivating history; book online today. 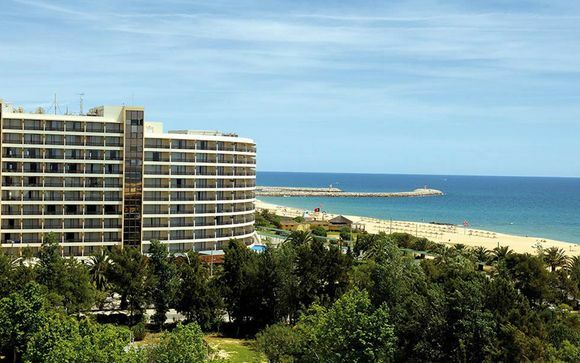 Vilamoura has long been known as southern Portugal’s coastal paradise, with the resort boasting some of the most picturesque beaches and crystal clear waters in the Algarve. But while it’s true that the coast is one of the most picturesque in the world, there’s far more to this bustling resort than simply sun, sea and sand. With our exclusive prices you can live like a celebrity, and discover luxurious pampering in world-class hotels, play leisurely games on the resort’s famed golf courses, spend days cruising on an elegant yacht, and maybe have a chance to spot dolphins beneath the depths of the azure sea. If at some point you tire of living the celebrity dream, then there’s always the opportunity to immerse yourself in the local culture and history instead. Visiting Vilamoura’s Roman Ruins of Cerro da Vila is guaranteed to enchant you, with its displays and remnants from the fabled Roman era enough to take your breath away. Art and vintage lovers, as well as curious holiday makers and seasoned travellers, will be enthralled by the ruins of the Roman baths, dams, fishing stations, and the eerie and beautiful necropolis. And after the sun, sea, sand and history, there’s still more to Vilamoura that will entertain and excite you, and can all be experienced with our great deals. If you find yourself yearning for a faster pace of life after a day spent delving into the past, then you’re in luck, because the exclusive resort’s night-life is second to none, and there’s truly something for everyone. The marina’s vibrant and enticing dining and social scene is sure to capture the heart of every holidaymaker and traveller alike. There are bars and restaurants to suit every taste, and a vast array of live performance halls and concerts on offer every day. From children and teens, to the young and the older, the hustle and bustle of the marina at night is an experience that’s not to be missed. Locals and tourists alike flock to the cosmopolitan area when the sun goes down to enjoy stunning sights, sumptuous food, and exceptional music. So whether you’re looking for first-class cuisine, days spent relaxing by the sea, a curious history lesson, or simply an exhilarating and exciting nightlife, this hidden paradise offers it all and much more. Now you can experience a taste of true Algarve luxury, in a resort that’s not to be missed. Sign up today to browse our selection of luxury hotels and take advantage of our hand-picked Vilamoura deals.